Staining and soiling are often believed to be interchangeable terms. This perception is not illogical—after all, don’t they both amount to a discoloration of the carpet? Browse through any carpet manufacturer’s warranty information, and you will notice that staining and soiling are distinctly separated, sometimes even carrying different lengths of warranties. So what is the difference? A stain is the most common concept of a discolored spot on the carpet. A stain occurs when a substance has come into contact with the carpet and embedded itself in the fibers. Most people understand that a cup of hot coffee spilled on a carpet could leave behind a stain. Stains work themselves into the fibers by soaking into empty dye sites. Empty dye sites are spots in the fiber that did not receive the colorant when the fiber was dyed. This occurs only in fibers that have been dyed post-production (i.e., the fiber was first produced in greige form and then colored after). Solution-dyed fibers have the color added in before production of the fiber, when the fiber is still in liquefied form, so the color goes all the way through the fiber, leaving no open dye sites to absorb stains. Certain types of fibers are more prone to staining than others. Nylon, for example, is a highly absorbent fiber, and so must be protected with a stain treatment. On the other hand, polyester tends not to absorb as much or as quickly, so it gives more opportunity for a spill to be cleaned up before a stain can set in. The best way to prevent a spill from soaking in and becoming a stain is to get to it as quickly as possible after it happens. Scoop up any solid matter from the spill, blot up as much of the spill as possible with a white towel or paper towels, and then treat the area with a stain remover product or a homemade cleaning solution of a drop of clear dish soap and a cup of lukewarm water. A soiled spot on the carpet has the appearance of a stain but is not necessarily the result of a spill. Soiling is the result of a residue or oily substance on the carpet fibers, which then attracts dirt particles. A residue can be left behind by a spot treatment product or a sticky spill that wasn’t fully removed or rinsed. An oily build-up could be due to a spill of an oil-based product (such as baby oil or cooking oil) but is often simply the result of walking on the carpet in bare feet. The oils from our skin can transfer to the carpet fibers by not wearing socks or slippers, and can then start to cause an accumulation of dirt particles. As with staining, certain fibers are more prone to soiling than others. Olefin, for example, is especially susceptible to oil-based products, making it fairly easily soiled. The best method for preventing soiling is ensuring that all spills are thoroughly cleaned and that all cleaning products used on the carpet are fully rinsed from the fibers. Blot up as much of the product as possible, using a white towel or paper towels. Follow by pouring a small amount of lukewarm water on the spot (approximately 1/4 cup; you can vary this amount depending on the size of the spot but be sure not to saturate the carpet—it is better to repeat this step several times than to overly wet the carpet the first time) and again, blot it up. To draw as much of the cleaner or oil out of the fibers as possible, cover the spot with either a thick white towel folded over a couple of times, or a stack of paper towels, and place something heavy over the towels (a pile of books works well). Leave this in place overnight. Also, wearing socks or slippers on the carpet helps to prevent the transfer of oils from the bottoms of your feet, which as noted above can contribute to soiling. Sometimes, after treating a spot on the carpet, you notice that it reappears. 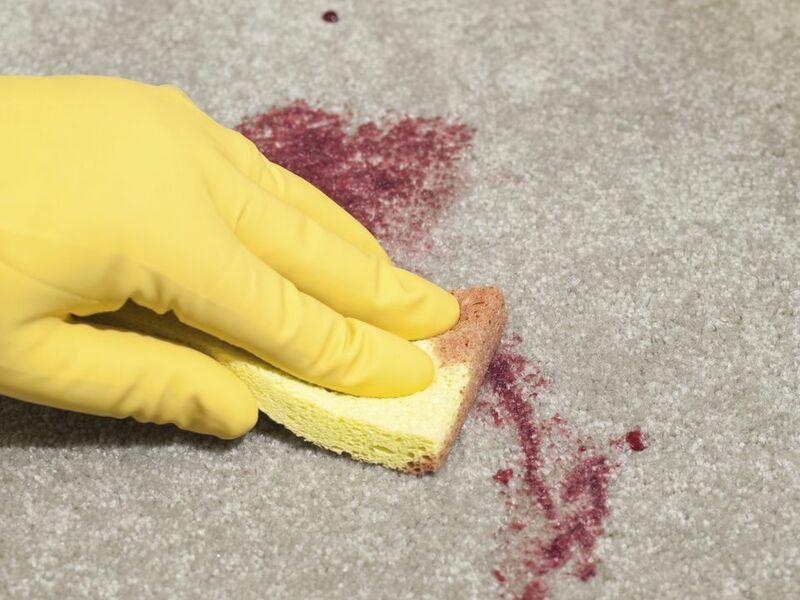 In the case of stains, this is known as wicking: the spill has soaked into the backing of the carpet or perhaps even the underpad and slowly makes its way back up the fibers to the top of the carpet. In the case of soiling, it just means that the residue or oil remains on the carpet, and is trapping dirt particles once again. If you notice the spot reappearing, repeat the cleaning/rinsing procedure above. Depending on the nature of the substance on the carpet, it may require several treatments before all trace of it is gone.